Can Synthetic Pheromones Help With Aggression in Multi-Cat Households? 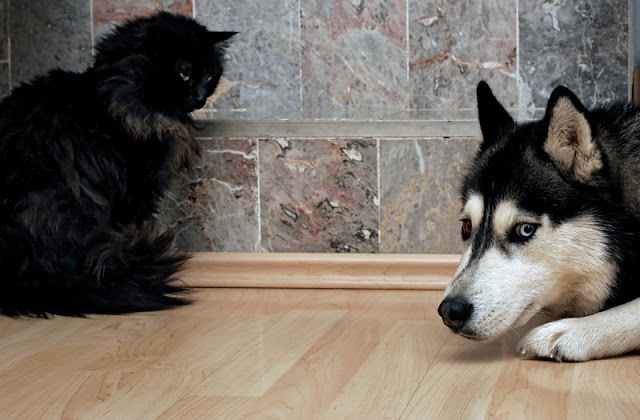 Promising results from a pilot study of synthetic cat-appeasing pheromones (Feliway Multicat) for aggression between cats that live together. Cat owners know only too well that cats can be choosy. As solitary hunters, the domestic cat can do just fine alone and does not have to be friends with other members of the species. On the other hand, cats can live in social groups, especially in colonies of female cats and their offspring, when female cats will help care for each other’s young. Many people have multiple pet cats and they aren’t always friends. It is obvious cats don’t get along if they fight. But there are also more subtle signs of cat aggression, such as when one cat blocks another cat’s access to a resource like the litter box. 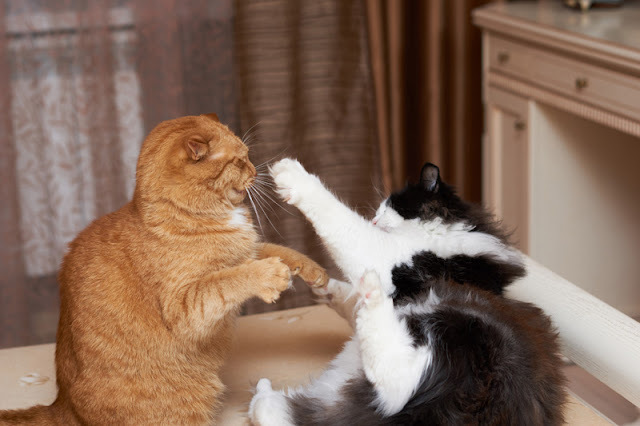 As well as bouts of aggression, when cats don’t get along they may hold urine for too long, pee outside the box, suffer feline idiopathic cystitis, over-eat or lose weight, or sometimes (if they have outdoors access) one of them may even leave home. 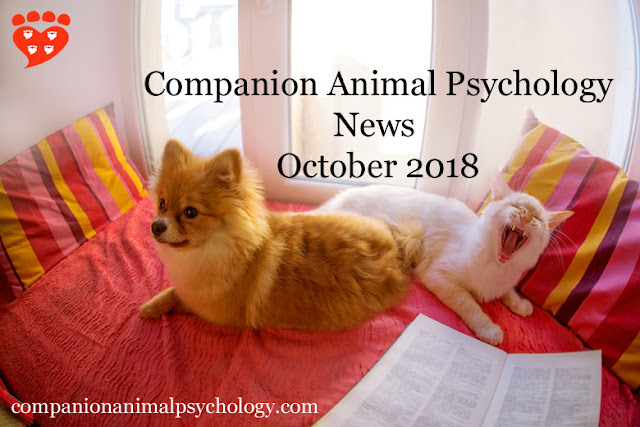 The latest news including an evidence-based guide to pets, what it's like growing up with wolves, and anxiety in pets and us. The Psychologist guide to … pets. I love these evidence-based tips on pets put together by Ella Rhodes. “Fido” or “Freddie”? Why do some pet names become popular? A fun and interesting post from Prof. Hal Herzog, complete with a quiz to test how popular your dogs’ names are. Do you want to know what the umwelt of a dog is? And what canine science experiments look like? The Scientist Podcast interviews Dr. Alexandra Horowitz. “Treating my cat for depression caused me to question the state of anxiety in animals and us.” Can a cat have an existential crisis? by Britt Peterson. Secrets of getting pee and poop samples from Fear Free. A tricky thing that many pet owners have to do sooner or later… what to do next time you need to take a sample to the vet. For shelter dogs, spending 15 minutes with a volunteer who will pet them when they want is beneficial according to both physiological and behavioural measures. Dogs in shelters may be deprived of human company. Can a short petting session help them feel better? A study published earlier this year by Dr. Ragen McGowan et. al. and published in Applied Animal Behaviour Science investigated the effects of petting from a stranger and found positive results. It is Thanksgiving weekend here in Canada and there is much to be grateful for. 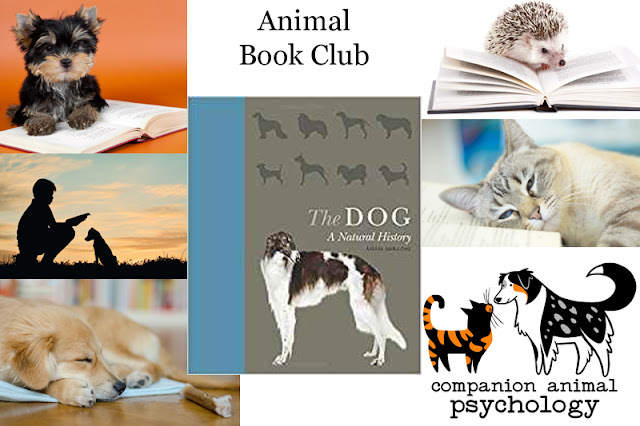 I am thankful for such a wonderful community of people who want to learn more about companion animals. I am thankful to have met so many amazing people as a result of writing this blog. And I am thankful for every one of you who, in your own way, does something to make the world a better place for pets (and people). 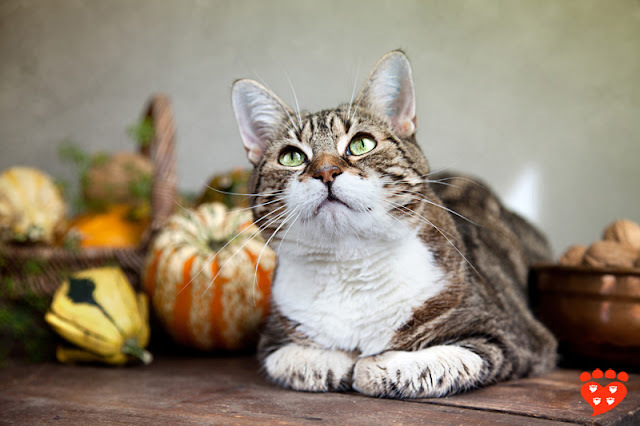 The beautiful photo of a tabby cat with pumpkins and walnuts is by Nailia Schwarz/Shutterstock.